I've never been a pushy purple person, either. But someone in my dim feminist gardening memories has obviously warned me about having too much pink. This has lead to scary rose resolutions, well documented in my journal, like: 'No more pink roses allowed!' And rhododendron resolutions, these shrubs permitted only if deep pink or cherry pink... Silly girl! Ha! Finally I've just got too old (mature might be a kinder adjective) to care about too much of any colour! And so pastel pink is alive and well in my garden. It's not just the roses (the softest David Austin pastels are blooming as I write). 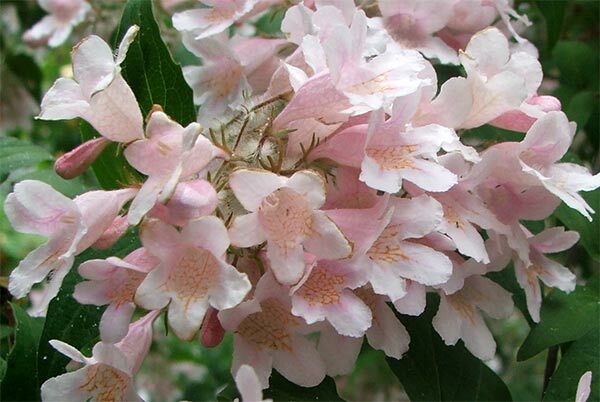 I've 'discovered' two fabulous, fluffy, pale pink spring flowering shrubs. One of the new shrubs was a mystery for some years, but no surprises as to why. Guess who kept on pruning this faithful, no-complaints bargain bin shrub at the wrong time of the year? Doing it on the wrong wood, so to speak, and getting no blooms. Silly! I had no idea she flowered so beautifully. Finally she and I got our gardening act together. 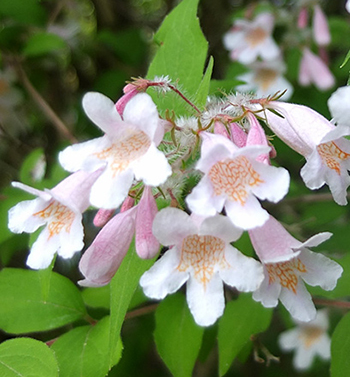 A kind internet friend has identified her as a Kolkwitzia amabilis, or beauty bush. 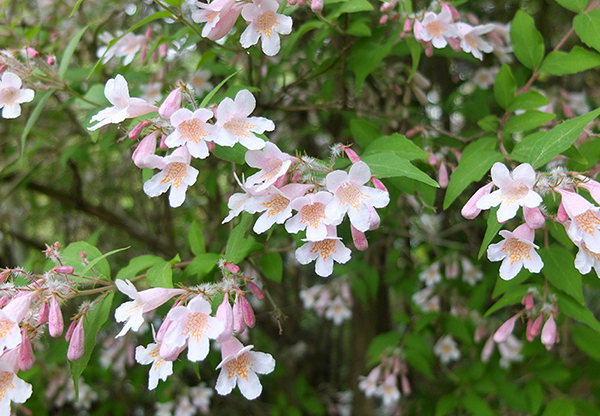 Being a budget plant, she will be very common, her arching branches covered with quasi-blossom, flowering in the gap season in late spring. I'm tickled pink!